We always carry binoculars around our neck, and are surprised that few other backpackers do this. We are birders and binoculars are the indispensible birding tool. 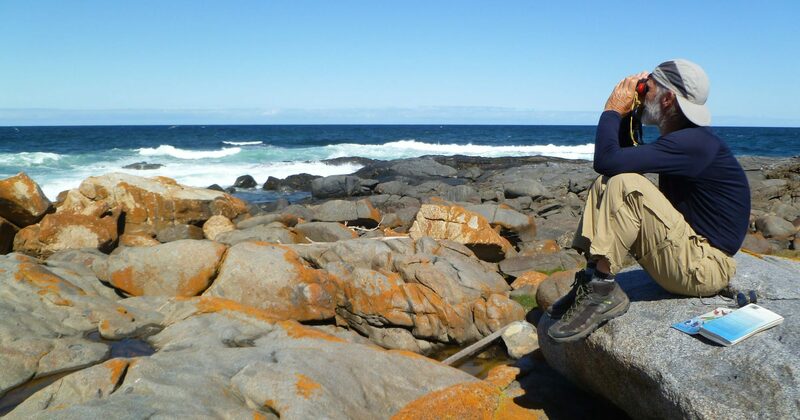 However, there are many other reasons we believe backpackers benefit from carrying a pair. Binoculars are often very useful for on-trail travel and almost mandatory for off-trail travel. You can evaluate route options from a distance and detect possible obstacles long before you reach them, therefore saving much time and effort. Does that ridge go? Can you ford the stream here or do you need to go elsewhere? Is high tide blocking passage along that distant beach? Is there a possible campsite in that clearing a half-mile away? Is that lump off the trail the cistern we are looking for or just a rock? Is there another cafe down the street and is it open? We use our binoculars constantly for navigation and cannot imagine traveling without them. Most people are not dedicated birders, but nearly everybody enjoys wildlife. Having binoculars makes all the difference in watching birds, mammals, reptiles, and even butterflies and flowers. How close do you really want to get to look at the interesting scales on that venomous snake? Is that really a whale making those splashes out to sea? Is that actually an owl sitting in the tree across the meadow? Binoculars are also a great tool for just viewing the landscapes around you in fine detail. Studying at the architectural details high on an Italian church or the bumps and weirdness in a Utah red rock landscape is very rewarding. You can check out that person ahead of you on the trail to figure out if she is a lightweight backpacker. You can spy on a party in a distant valley as they set up tents and prepare dinner. Expect to pay $200 to $400 for binoculars suitable for backpacking. 8×28 or 8×30 or 8×32 are good compromises between weight and optical clarity. The ergonomics matter a lot. They must feel good in your hands and against your face. The weight must be acceptable or you won’t have them around your neck where they must reside to be useful. The shoulder strap that holds them must be comfortable and adjusted to the right length. The eyepiece cover caps should be attached to the strap and easy to quickly remove and replace. Choose a model that is fog-proof and warranted to be waterproof. The optics will be good enough on any binoculars that cost over $200. Focus on weight and ergonomics. This list has Affiliate Links. We donate all proceeds to non-profit land conservation groups. Read our Code of Ethics. All models on this list meet the needs of backpackers: waterproof, fog-proof, close focus under 8 feet, weight less than 18 oz, good-enough optics, reasonable durability, good ergonomics. We are linking to Amazon, which sometimes has the lowest prices on binoculars, but you should check other suppliers as prices are often quite varied. 13.8 oz, MSRP $265, actual price ~$230. These are the binoculars Amy used to carry while backpacking and are an excellent choice for those optimizing for low price and light weight, particularly those backpackers who have never carried binoculars and don’t want to spend much money. Three options in the 15-18 oz, ~$300-400 range. The following models are excellent binoculars with better durability and better optical clarity than the Opticron Discovery, but at greater cost and weight. These models should last a lifetime if not seriously abused, and choosing between them would depend on fit and sale price. 17.0 oz, MSRP $455, actual price ~$300. For many years Jim carried a earlier generation of this model. They held up very well after years of abuse and he is still happy with them. 15.3 oz, MSRP $380, actual price ~$330. Amy currently uses these. They have received excellent reviews and Nikon binoculars have a reputation for durability and optical quality. In many reviews these are the gold standard small lightweight binoculars that other models are compared to. 18.0 oz, MSRP $370, actual price ~$370. Jim is currently using this model for backpacking. They were provided for free by Zeiss. This relatively new line from Zeiss is less durable and much less expensive than the top-of-the-line Zeiss models. The optical clarity is quite good, but the long-term durability is unclear. For top of the line optics and exceptional durability with unlimited lifetime warranties (including replacement for binoculars damaged in abusive situations), one must spend more money, and that is beyond the scope of this list. You can spend anywhere from $30 to $3000 on a pair of binoculars. At the high end you get superb optical performance, extreme durability and meaningful lifetime warranties. Drive you car over your binoculars and they will replace them. The low end is useless junk. For a decent pair of lightweight waterproof backpacking binoculars that will last many years expect to pay from $200 to $400. More expensive binoculars would likely provide better durability, a better warranty, and incrementally improved optics. Binoculars are identified with two numbers that will read 8×32 or something similar. The first number is the magnification; backpacking binoculars should have a magnification between 7 and 10. Smaller and they become pointless to carry; larger and they become too heavy and are difficult to hold still enough to be useful. The second number is the diameter of the objective lens in millimeters. The larger the lens diameter, the brighter the image, however the weight of binoculars goes up quickly with increased lens diameter. The most significant trade-off is between weight and clarity in low light conditions. You never need more than a 1:5 ratio (7×35, 8×40, 9×45, 10×50) between magnification and lens diameter as anything greater provides more light than the eye can use. If optimizing for low light conditions, 1:5 is ideal; if optimizing for weight 1:3 is acceptable. A good compromise for backpacking is 1:4, i.e. 8×32. Anything over 35 millimeters is going to be too heavy for most backpackers. Anything less than 25 millimeters is going to have poor light gathering ability and possibly a poor field of view. Any decent pair of binoculars will have coated lenses. These coatings, often multiple layers of them, vastly improve optical performance. You don’t need to worry about the specifics. Be aware that these coatings can be a bit fragile, so clean your lenses with a soft clean cloth or lens tissue. Do not use hot water. Particularly for backpackers, the binoculars must be warranted to be waterproof. If you carry binoculars outdoors, they will get wet: count on it. Any water inside a binocular and the internal surfaces of the lenses will fog, most likely permanently. The glasses should also be factory filled with an inert gas like nitrogen or argon. These gases displace the air inside the instrument. That air contains some moisture. Take warm binoculars outside into the cold and that moisture will condense, again on the inside surfaces of the lenses. Moisture on external surfaces of waterproof binoculars is not a problem can be easily wiped away with no damage done. Close focus is very nice to have. Many binoculars can now focus down to a few feet. This is handy when looking at bugs, reptiles, flowers, or in lucky Jim’s case, an echidna curled up between his feet. Many brands offer a very lightweight binocular model, often described as pocket or compact, which folds into itself along two sets of hinges. These are notoriously slow and fiddly to deploy, and although the weight and size are attractive, we recommend avoiding any model that folds along two junctions instead of a single center-line hinge. Binoculars are made with plastic, aluminum and magnesium frames. With metal frames the binoculars are much less likely to get knocked out of alignment. Magnesium frames are lighter but usually more expensive than aluminum frames. You will need a shoulder strap that you can use comfortably when wearing your pack. If you don’t carry your binoculars in a handy place, you won’t use them. Many models come with fancy padded straps or shoulder harnesses which are unnecessarily complicated or too heavy for backpackers. Straps can be replaced with a simple piece of nylon webbing, as shown in the photograph. Eyepiece cover caps are essential to keep crap ranging from raindrops to pine needles to blowing sand from falling into the eye cups. The caps protect the lenses and also protect your eyes, since that crap lands in your eyes in your hurry to catch a glimpse of the mountain lion that just crossed your path. 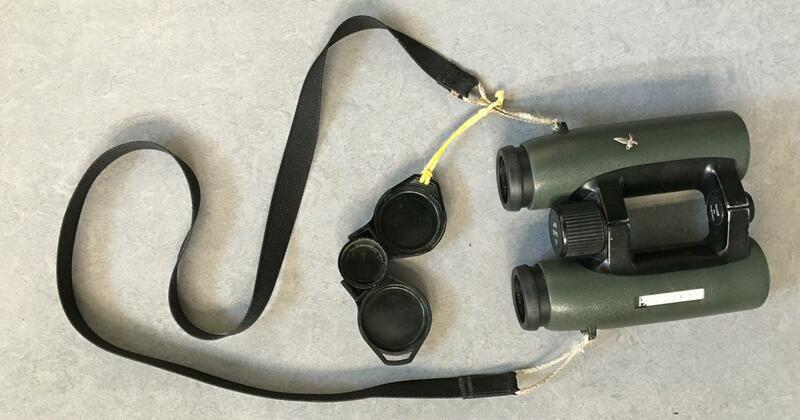 Many binoculars come with caps that are already attached to the strap, however some of the caps are fiddly to use and not easily deployed and replaced. After market replacement caps are available if the ones on your pair are bad. There are many brands and models on the market. For backpackers’ purposes, the better brands have functionally equivalent optical quality. Companies make claims why their model is better, but ignore the marketing noise. The best way to choose a pair is to visit stores and try the various models. Some will fit your face and feel better in your hands than others. If shopping online be sure you can return them if they don’t feel comfortable. Take them outside and try focusing on a far horizon or the moon and make sure they work with your eyes. Also try focusing them at something four to six feet away. After all the traveling I’ve done with my binoculars safely tucked away deep in my backpack, I finally cottoned to the fact that they must be around the neck at all times in order to be of any use at all. I now want a really good pair so this guide is extremely helpful. I do wonder whether you have a trick to keep them from bouncing around on your chest, without having them so harnessed that they aren’t instantly accessible. Over-the-shoulder so they hang diagonally. Trick is to make the strap long enough to comfortably lift to your eyes, but no longer than necessary. There are also fancy harness systems that are increasingly popular with birders; I’ve tried those but never found the extra complication made them worthwhile. The Leupolds are now $280 on Amazon. I own the Nikon Monarch and it is excellent.